Description: The Fleet Admiral commands the fleet and is chairperson of the Admirals Council. In addition to the powers given to this position by the FC Constitution, the Fleet Admiral is granted great leeway with command decisions. However, he is still binded to report important day-to-day command decisions to the Council, as well as submit non-critical legislation to the council for voting. If a councillor believes that the Fleet Admiral has over-stepped his authority with regards to non-council command decisions, he/she is permitted to cast a vote to veto the order. The Fleet Admiral is permitted to promote up to and including the rank of Admiral; demote officers ranked Admiral and below. Description: Typically the Fleet Executive officer, an Admiral is almost always a member of the Admiral's council and is given significant leeway with command decisions. If an Admiral is the Fleet Executive, he/she has the power to declare war in extreme situations if the Fleet Admiral is unavailable but must have at least one other Admirals agreement before such action can be taken. It is expected that if the Admiral steps outside the bounds of his/her powers, the Fleet Admiral or Fleet Executive will point this out, no other officer may do so. The rank Admiral is permitted to promote up to and including the rank of Starfleet/Operations Admiral; demote officers ranked Starfleet/Operations Admiral and below. The Fleet Admiral can restrict rank-based promotion/demotion rights. 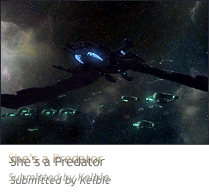 Description: Traditionally is the fleet 2nd officer, and is almost always a member of the Admiral's Council. He/she does not have the power to declare war even under the most extreme circumstances. He/she is given some leeway with command decisions, and it is expected if the Vice Admiral steps outside the bounds of his/her powers, the Fleet Admiral, Fleet Executive or Admiral will point this out, no other officer may do so. The rank Vice Admiral is permitted to promote up to and including the rank of Commodore; demote officers ranked Commodore and below. The Fleet Admiral can restrict rank-based promotion/demotion rights. Description: Traditionally the Rear Admiral is a is a member of the Admiral's Council, but this is not always the case. He/she is only given leeway with command decisions that are part of that officers other duties (such as Starfleet Command) which are affirmed by this officers high rank. It is expected if the Rear Admiral steps outside the bounds of his/her powers, The Fleet Admiral, Fleet Executive, Admiral or Vice Admiral will point this out, no other officer may do so. The rank Rear Admiral is permitted to promote up to and including the rank of Commodore; demote officers ranked Commodore and below. The Fleet Admiral can restrict rank-based promotion/demotion rights. Description: An officer who holds the rank of Commodore is now a skilled leader with much experience and usually holds a command position within Starfleet or Operations. This is the most senior pre-admiral rank and a Commodore is seeking direct entrance into the Operations/Starfleet Admiral ranks. The Commodore is expected to excel in his/her duties and prove to his/her Starfleet and/or Operations commanders that they are the best candidate for advancement. Description: The first rank to be considered a Senior Officer. Typically a Squadron CO or Department XO, this officer is very active and is a great pilot. He/she is seeking advacenemt into the Starfleet/Operations Admiral ranks and is expected to prove to his/her Fleet and Department Commanders that they are the best candidate for advancement through leading by example and doing their duties above and beyond what we expect of them. A Senior Captain is a rare distinction bestowed upon particular distinguished Captains. They hold authority over regular Captains. Description: This Officer acts in much the same way to a Squadron or Department as a Vice Admiral does to the Council. He/she is expected to lead by example, and back up Squadron, Department and Fleet Command on their decisions regardless of their own feelings. This officer is generally a Squadron CO or Department XO who is seeking to become a senior officer and hold a higher command spot, and the best way to do this is to show an unusual blend of both obedience and independant thought. Description: The first solid "Officer" rank in the Fleet. A Lieutenant Commander is basically a Junior Commander, he-she has the same duties and responsibilities of a Commander and is often a Squadron CO or XO, and maybe a Department XO but is not as advanced. He/she is expected to lead by example, and back up Squadron and Fleet Command on their decisions regardless of their own feelings. This officer is seeking a higher command spot, and the best way to do this is to show an unusual blend of both obedience and independant thought. Description: Last rank of the "Junior" Stage and is considered ready for a Squadron XO position if a place is available. This officer is now well out of the Academy (trial period) the and has a good foundation for the game he/she plays and is expected to follow the orders of superior officers and to assist newer members into adapting to the FC way of life, as this is what Squadron Commanders like to see. Description: Still a new officer to FC. A Lieutenant Junior Grade has some distance between him/her and the Academy (trial period) the and has a reasonable foundation in the game he/she plays and is expected to follow the orders of superior officers and to assist newer members into adapting to the FC way of life, as this is what Squadron Commanders like to see. He/she wishes to soon be a Lieutenant, after all. He/she may also be given a squadron XO spot if the place is available to accelerate his/her career. Description: Fresh out of the Academy. This officer now has to focus on improving his/her own gaming abilities and spend time learning what it is to be a good officer in the Federation Command. Description: A Cadet in the final stage of the Academy studies. This prospective officer is expected to graduate and be commissioned as an Ensign in the fleet. Description: A Cadet in the third stage of the Academy studies. Description: A Cadet in the second stage of the Academy studies. Description: A new member to our fleet. By default, every new member in FC is required to spend an approximately one month trial period in the Academy learning all the basics of what being a FC officer is all about.